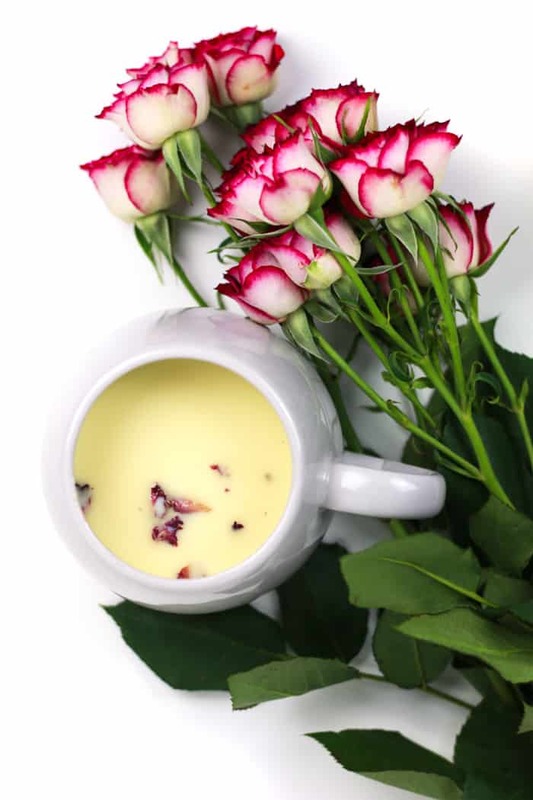 Make Valentine’s Day a little sweeter with a cozy cup of Rose White Hot Chocolate. 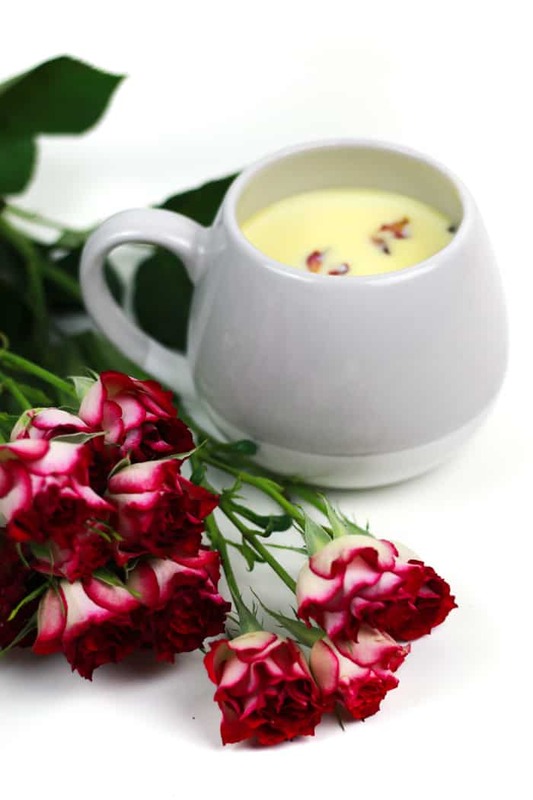 Sharing a batch of this creamy, floral nectar is just as romantic as giving (or receiving) chocolates and a dozen roses! So Valentine’s Day is here, and I’ve been trying not to roll my eyes about it ever since I saw the heart stuff at Target before New Year’s Eve. Seriously. I’m not single these days, but even still, I don’t love Valentine’s Day. Pink isn’t my color. I don’t want a dumb teddy bear. And I definitely don’t need any more stuff or weird flavorless candies. Decorating shoebox mailboxes in Kindergarten. Attending a totally awkward Valentine’s Dance in 9th grade. Making chocolate-covered strawberries with my gal pals in my dorm room. So, nothing to see here! Chris and I can’t even remember what we did last year! I’m pretty sure he bought me flowers and chocolate though. (More specifically, a box of chocolate caramels because he knows they’re my favorite). Those are the staples of every Valentine’s Day, whether you like it or not. And really, who are you if you don’t like either of these things? Even me, a stalwart cupid dissenter cannot say no to flowers and chocolate. That’s why today I’m putting them together into a drink that’s perfect in February whether you’re celebrating or hating Valentine’s Day. 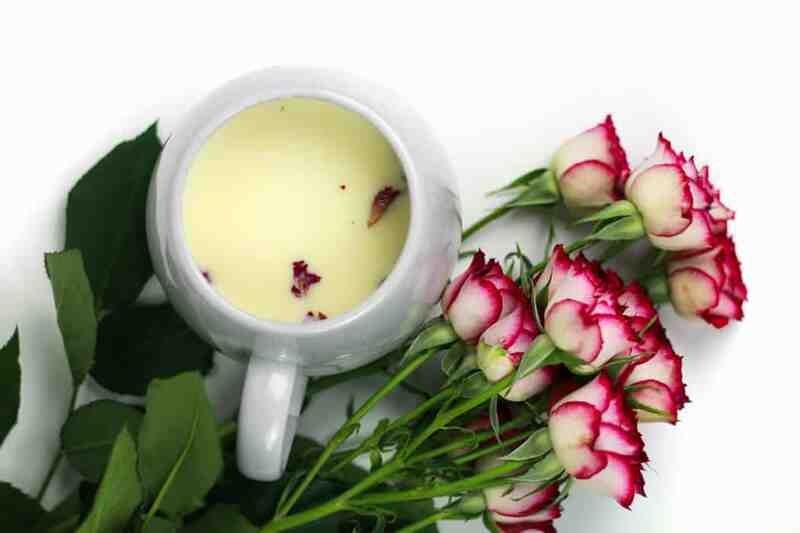 Rose White Hot Chocolate marries flowers and chocolate into a smooth, creamy drink that’s cozy with a hint of rose. 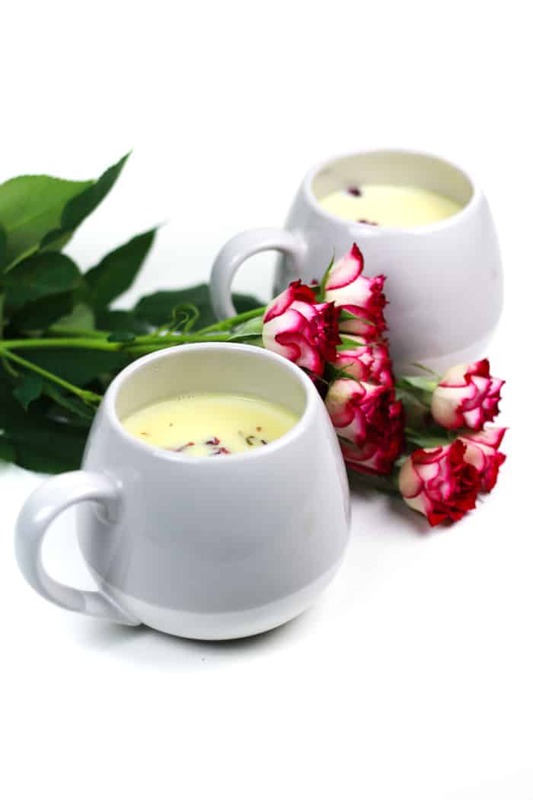 Certain flowers can be edible and drinkable. 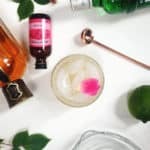 If you’ve been following a long time, you might remember this Elderflower Rose Gimlet or this Elderflower French 75 Cocktail. 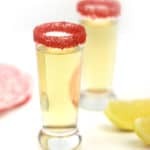 They actually make a lovely flavor in cocktails, like you’re tasting exactly how they smell. It’s weird at first, but so cool! 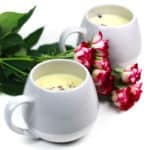 You can make this drink on the stove, melting together cream, real white chocolate and a hint of rose water, plus a few edible rose petals for effect! 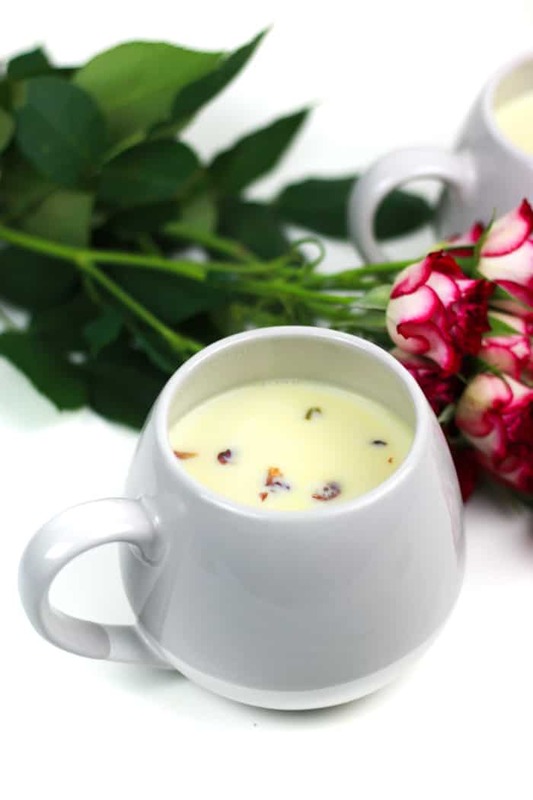 Rose water is a flavored water made by steeping rose petals in water. It’s very common in Middle Eastern recipes and it’s a great way to add a bit of floral flavor to baked goods and drinks. If you want to add booze, I’d suggest vodka or even a white chocolate liqueur. 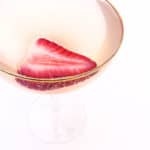 This drink is perfect for Valentine’s Day, and Galentine’s Day too! Speaking of which! I’m teaming up with some fellow bloggers today in the fight against pediatric cancer. We’re all sharing Valentine’s recipes in hopes that we can make a difference! Did you know that cancer is the #1 cause of death of children by disease in the U.S.? There are 40,000 U.S. children actively battling cancer right now. With fewer than 4% of the National Cancer Institute’s budget going to all childhood cancer combined, it is important to get involved. Help us make a difference by donating to Cookies for Kids’ Cancer! Our goal is to raise at least $3,000. Because these three companies: Dixie Crystals, Mediavine (where I work!) and OXO have each pledged to match our donations raised through this campaign up to $3,000! Thanks to many of you, we have reached our goal. If you are able, you can still donate and help us make an even bigger difference! 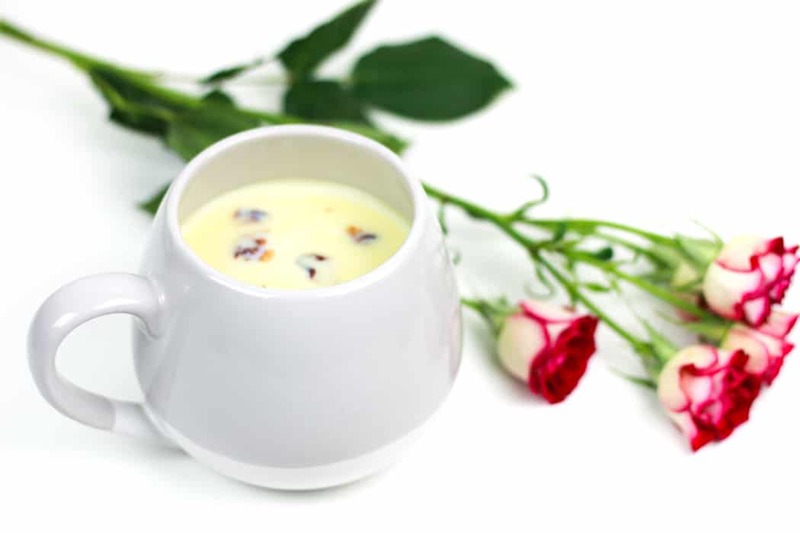 In a medium saucepan over medium-low heat, stir together cream, vanilla and white chocolate until chocolate has melted. Bring mixture to a low simmer (but don’t allow a boil). Remove from heat. Stir in the rose water. Immediately pour into two mugs. 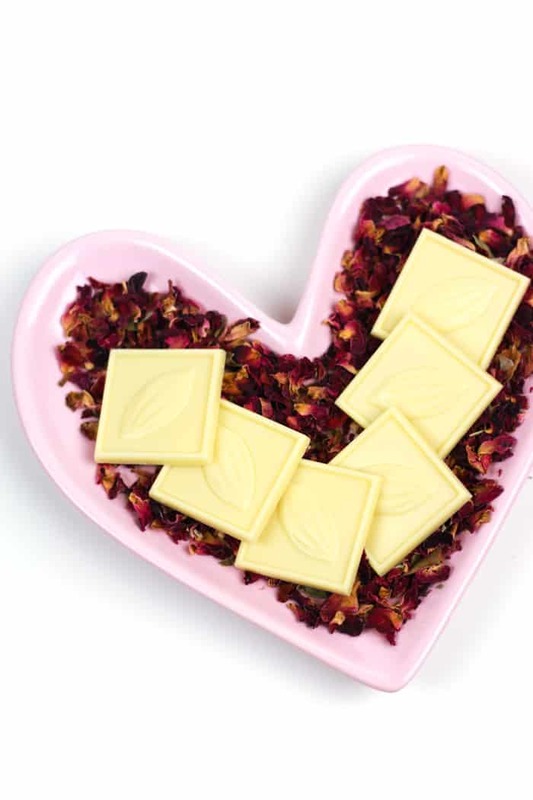 Sprinkle with rose petals if desired. Substitute white chocolate chips if you wish! Feel free to add 1.5 ounces vodka or white chocolate liqueur if you wish. Check out some of the other delicious treats from the other bloggers who participated! I would have never thought to have paired those two ingredients. Genius! Happy to be participating in this event with you and the others. 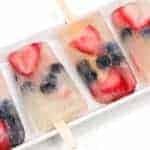 I would just love to sit on the porch with one of these .This sounds so yummy and refreshing!